Last Thursday, I was invited to the launch of some products under Shiseido brands Tsubaki, Aqualabel and Senka at Coastes Sentosa! They are some products to counteract summer and protect your skin from the harmful sun rays. 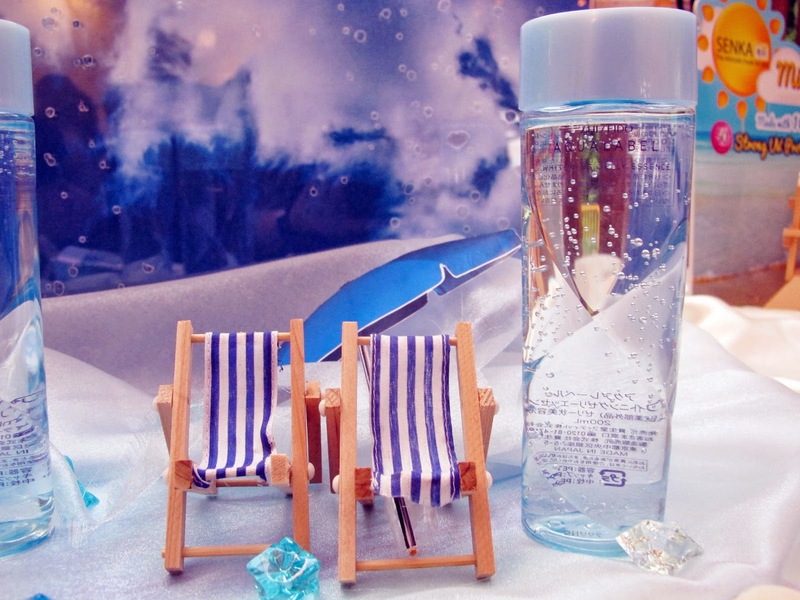 I've got to say, that they are the perfect type of products to be launched in Singapore because its summer all day err day here! It was held in a beachy pubby restaurant, Coastes, in Sentosa and it was mildly warm there ~natural air~ Generally there were game booths where we could take home some samples of the brands, but I didn't take pictures due to bad lighting (or my bad camera that couldn't take photos in that sort of lighting). The displays were veryyyyyy cute. 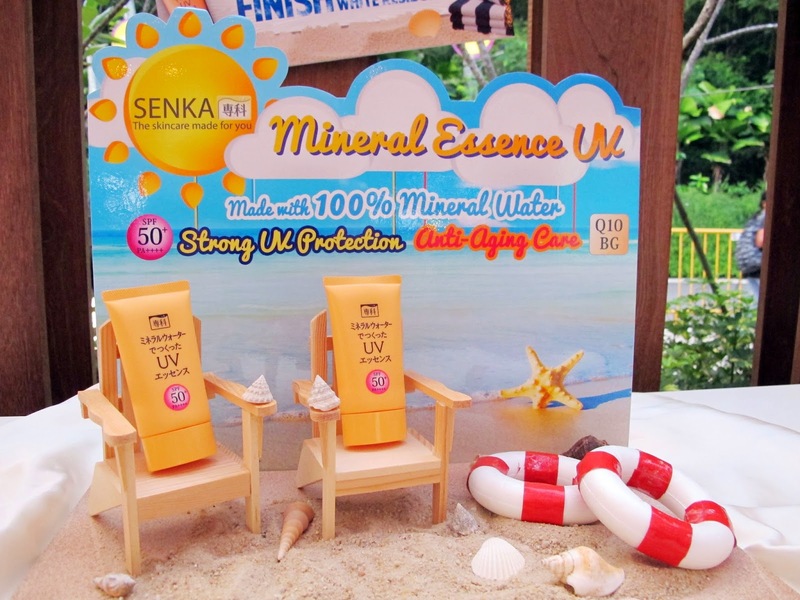 Love the Senka sunblock one the most. Diggin' that mini chairs and sandy floor! I've been trying the products since the next day when I received it (that explains how excited I was to try them) till today as I'm writing this post. Not exactly a review, but more of a first impression kinda post. Firstly, I saw this Aqualabel Whitening Jelly Essence on a video from my favourite beauty blogger. She was mentioning how much it helps her sun spots and I am sold. Not exaggerating, but I am very easily influenced when it comes to products that sounded like it works great. Prologue: I have combination skin and am acne prone. I use this as a last-step item for my nightly routine (have always been using emulsions as a last step at night) and use this right before my makeup in the day. As quoted from the press release, its a 4-in-one product where you can use it to substitute any of this step in your routine: Lotion/ Emulsion/ Serum/ Astringent or use it as an all-in-one, one-step product. I will share more when I do a full review on it about its effects, but I do like the astringent effect best as it DOES shrink my pores and makeup goes on nicely. Also, only a small amount is needed each time as the jelly breaks down into liquid upon massaging onto the face. It costs $29.90 and is already launched on 1/5/14 exclusively at selected Watsons stores :) Super worth the money I would say, considering each bottle is 200ml. 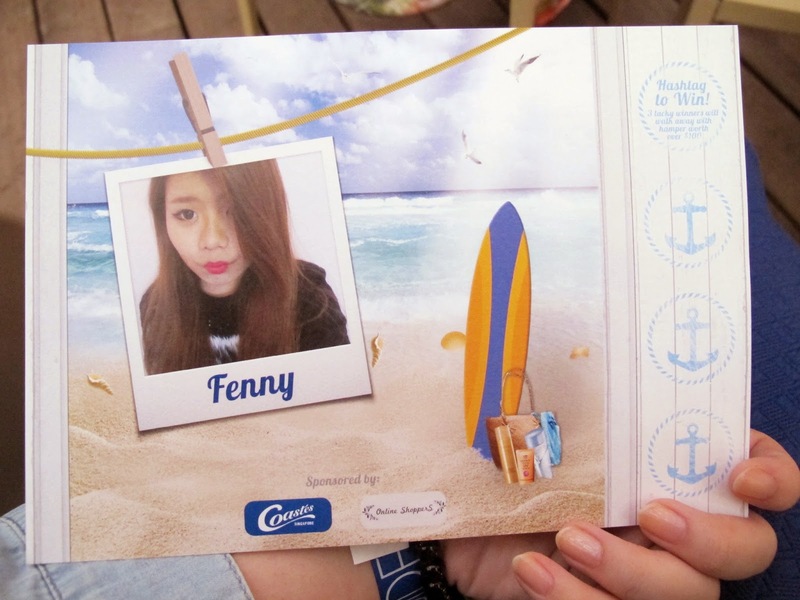 And behold~ My favourite product from the launch! Its the Tsubaki Head Spa Sparkling Serum! 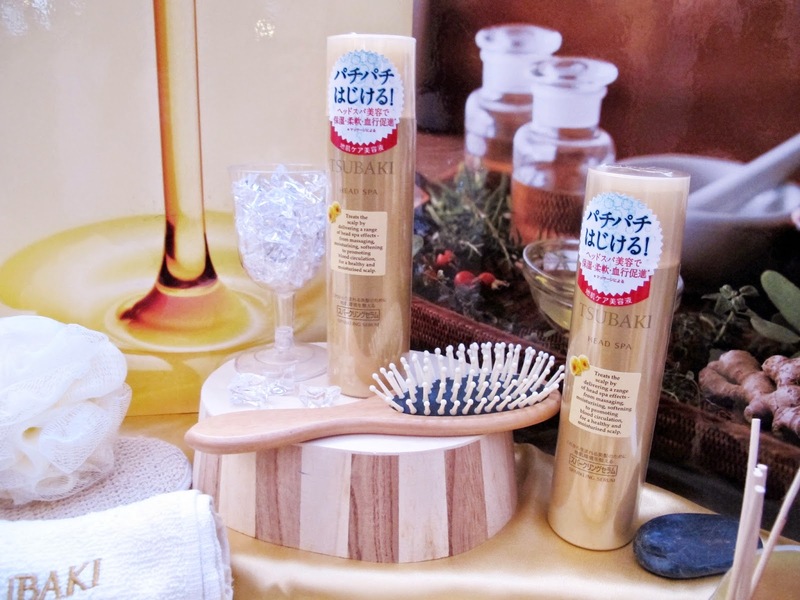 I've used some Tsubaki products and honestly I felt that it was too rich for my scalp; it makes my scalp oily. This product is a "leave-in scalp essence that delivers a range of head spa effects - from moisturizing, softening to stimulating blood circulation for a healthy, moisturized scalp." I was taught some massage techniques at the event and after washing my hair that night, I tried it. Its waaaaay too therapeutic for my busy brain!!! Had a good sleep that night. Its a pretty interesting product because the serum sizzles upon releasing and also when you apply (press) it onto areas of your head, it feels cooling and sizzles even more; it meant that the serum is penetrating the scalp. I do agree that it is non-sticky, softening and relaxing. I use it about twice a week and hope to use it thrice a week if I'm not lazy :P Will go into details of this product when I use it enough to give a review. In the mean time, this is freakin awesome!!! #notPRatall. Oh, not forgetting that it smells heavenly. This Tsubaki Head Spa Sparkling Serum is available exclusively in Watsons from 29/05/2014 onwards, for $18.90. Its a large spray can; 130g of spa goodness! Currently enjoying these products and will probably be posting em' reviews by mid next month, so do look out for it!